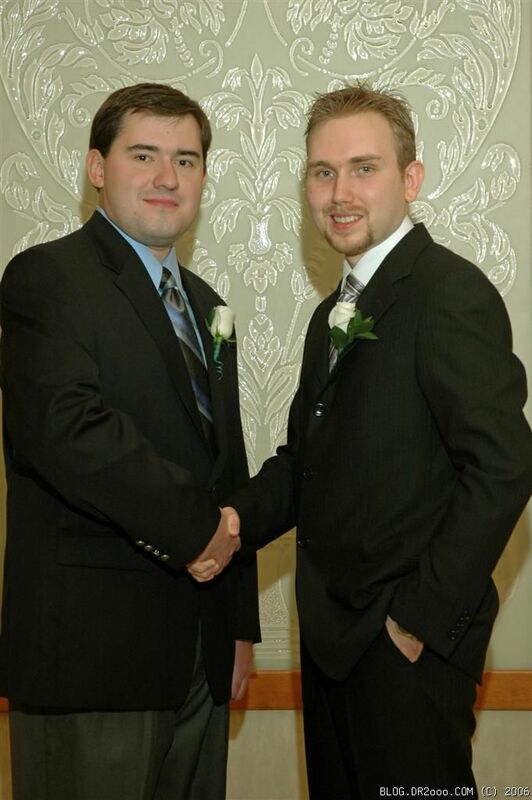 It looks like I made the previous post about the wedding dinner a bit prematurely. We had to change our plans because of the way everything was handled by Rio’s personnel. I wanted to leave a couple of lines about the experience with them here. First of all they were very unresponsive to any questions, be it by email, or phone. I would have to call and ask for menus, wine list and other information 5 or so times before I would get an email. Every time they would promise an email within minutes, or until the end of the day, but it would never be true. After about a week of frustration I finally got a contract from them for dinner reservation. To my disappointment I found out from the contract that we have a 2 hour limit on the time that we can spend there. It seems they are trying to screw you any way possible for the fact that you’re bringing them a lot of business. That just doesn’t make any sense to me. I called several other places and the shortest time limit that I found was at least 2.5 hours. So I called back and asked them to extend it to at least 2.5 hours. After 3 day of waiting I received a response saying that it can be easily done, but it will cost me an additional $500. This response is a spit in the face of the customer who wanted to bring them a lot of business and is just plain insulting. I wished them luck in their future endeavors, but said that I’ll have my dinner elsewhere. After all, it’s not like they are the only restaurant in the desert. It’s Las Vegas, for god’s sake!! 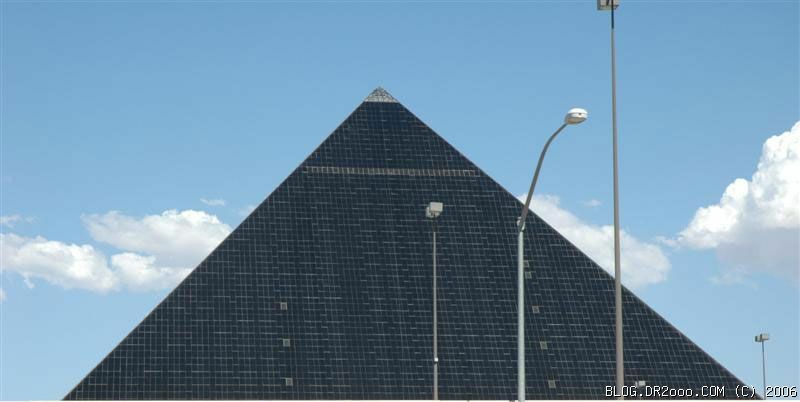 We contacted a person in charge or Luxor’s group reservations for Luxor Steakhouse dinner. Every time I talked to her I got a response in the email within minutes after I put the phone down. We selected a pretty good menu with a choice of steak, fish and chicken as entries. We will have a nice wedding cake and a private room in a restaurant of a much higher class then our first choice was, for a bit higher price. All in all we’re happy with the end result, all contracts are signed, and everything should be final at this point. With us trying several board games lately, I’ve run (so to speak) into another kind of popular non-computer gaming: trading card games. The reason it caught my attention this time around is because a World of Warcraft one was release, and I saw some information about it on WoW official site. To make long story short I bought a couple of starter kits (for Alena, myself and one other person) and a bunch of booster cards for that other person. Now in the past 3 days I’ve been trying to read the rules book over and over again, trying to understand how it works. 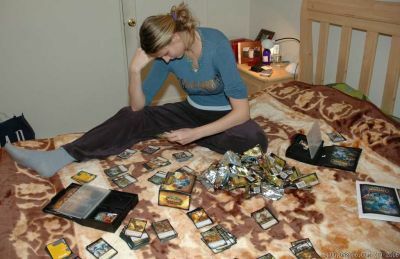 The fact that I never played any games of this kind before makes it a bit complicated the first time around, so I asked a bunch of “noob” questions on one of the sites dedicated to the new game (WarcraftCCG.com). The members of the forum were kind enough to reply with a number of detailed responses. I figured I’ll post the short Q & A session that resulted here, to help other like myself. Q: Rule book says that the deck should have at least 60 cards. Yet they say that originally we should not mix the pre-set hero deck with anything. I’m assuming it means that we should try to play with 30 card deck originally to make the game simpler to understand? Basically don’t pay attention to 60 card rule while you’re learning? Or did I misunderstand it? A: Correct, that is just basically so you understand the basics. 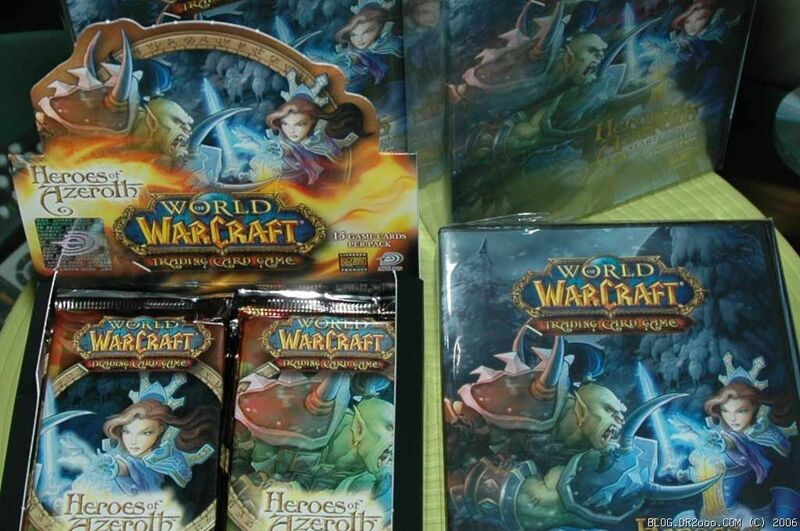 The starter deck contents are made to be playable out of the box. As such it will be easier to learn with them remaining unmodified. Q: Resources is the way to pay for the use of other cards. Is the idea that I should select the most useless cards in my hand to put down as resources, since they will be used as currency and nothing else? A: Yes, either that or quests. Quests are made to go into the resource row to be useful. If you have a quest in your hand always put it in the resource row, but if you don’t just pick your most useless card. Q: Pay for actions: if the card that I want to use costs 3 resources does that mean that I have to exhaust the card that also costs 3 in my resource area, or does it mean that I have to exhaust 3 cards, and the values on resource cards have no meaning? I’m thinking it’s the latter, but having seen cards that have a cost of 9 makes me wonder if I’m right. A: Any card in your resource area, except quests, are placed face down. Each one, including quests, counts for 1 resource. Once a non-quest card is in your resource area it’s values have no meaning anymore. So if my ability costs 4, I need to exhaust 4. Q: Double use of cards: I’ll use weapon as an example. I saw cards that have 2 uses for them. Basically the primary use as a weapon, and then some special ability. How are those used? I can pick either one, but not both, correct? For example, if I strike with a weapon, the card becomes exhausted. So at this point I would not be able to use the special ability, correct? And vice verse, if I used some special ability, I can not use the weapon to strike with? A: You are partially correct here. To Strike with a weapon the weapon must be ready (not exhausted). If a weapon has a special ability the weapon doesn’t necessary have to be ready to use that special ability. You can use any weapons special ability if it is exhausted as long as the ability doesn’t require you to exhaust the weapon. For example the Headmasters Charge is a staff that can be used to strike with and use its special ability. It doesn’t have to exhaust to use the special ability so this is okay. But if the special ability require you to exhaust the weapon than you must choose either to strike with it or use the special ability. Q: If I’m totally confused with the above and I’m misunderstanding it: maybe striking with a weapon doesn’t make the card exhausted? If that’s the case I can use it as many times as I can pay for the use? Can I still strike with it after I used the special ability of the card and it has become exhausted? A: Strike with a weapon requires you to exhaust it so you can only do that once. Now what matters is what the special ability requires you do to pay its cost. If the special ability on the weapon requires you to exhaust your hero or the weapon then you with have to choose to strike with the weapon or use the ability. Q: Sometimes special abilities seem to have cost and sometimes they do not. Does it mean that if there is no number in a circle in the power (special ability) box, then I can just exhaust the card and use it without paying? I only pay for the time when I place the card itself in the play area? A: If the card has no number in the circle, then it has no resource cost to use it. However, you only exhaust the cards to use their game text when that card specifically tells you to. Q: Hero special powers. Can I use Hero’s special power once per game, or once per turn? In other words if I use the hero power and flip the card, does it get reset at the start of the next round, or no? A: Once per game, currently once a Hero is flipped there is no way to reset them. If you flip your hero it stays face-down until the end of the game. Q: If you have more then 7 cards in your hand at then end of the turn you must discard cards until you have 7. Do I pick which ones to discard? Also where do they go? Back into the deck? Graveyard? Out of the game stack? A: You choose, and they go to the discard. Q: Getting cards ready: do players get their cards back into the ready state at the beginning of every turn or only at the beginning of their own turn? So for example if Hero used a weapon to attack once it gets exhausted. Then the other player attacks that hero in his/her turn, is the weapon still exhausted (to strike back) or was it reset back to ready? A: Only at the beginning of their own turn. So if you want to strike back with a hero you can’t use his weapon on your turn. Q: In the action phase there is one step where players can place a resource. Can that resource be placed as the first step of actions phase and then be used for costs, or it HAS to happen only after the Play Cards and Use Powers steps? If so, can it be still used as means of payment for the upcoming attacks? A: You can do anything in the action phase in any order. So you can play an ally, play a resource, attack with an ally, play an ability, play another ally, attack with another ally, etc. We are going to try to have our first match tonight, after work and see if we get the rules and if the game is a fun one to play. I was wonderring, sometime they say your hero can be exhausted, but how can a hero get exhausted? and what happens when it is exhausted? It says i can still use weapons and abilities when the hero is exhausted… so what are the consequence of having an exhausted hero? I also had another question, if my hero gets attacked, my hero becomes the defender. If he has an active weapon, and i want to strike back the attacker, do i have to pay the strike cost again? or do i pay the strike cost only when i want to make and attack? Oy, man! We haven’t played this in quite some time now, so I’m sorry to say, but at this point I have no clue. I just don’t remember anything. Sorry about not being able to help. From what I remember the maker of the game had a nice forum on their site with a lot of knowledgeable people. Maybe you can find some help there. Today we spent the most of the day interacting with WoW TCG (or looking where to get it). Initially I called GameSpot on Kings Plaza to find out if they had any booster packs in stock. They said they did. Sadly, when we got there, we discovered that there are 3 GameSpot’s there and all 3 of them had everything sold out. Checked some stores on 86th, same deal. I did a search online and found some obscure store in Brooklyn China Town (58th Street and 8th Avenue) and they said they had some in stock. When we got there, they indeed had some in stock – a full unopened box (24 packs)! :! : And we bought the full box for $85 instead of a $100 that we’d end up paying in GameSpot or EB Games and such. Needless to say we were pretty happy. So we put aside the new box and decided to split the opened up (with 23 packs) between ourselves. Alena got 11 and I got 12. We found 2 epics in ours, and I was pretty happy. Alena was upset that we didn’t get a legendary turtle. Maruk called and said that he wanted to chill, but Alina was not feeling well, so he would be alone. I figured that I can’t really wait until tomorrow with his gift (yeah, if you didn’t guess yet, “one other person” in the previous post was him) for his birthday, and told him to come over. He came over, we gave him the present, explained what it was and how it worked and he seemed to enjoy it as much as we did. Went through opening 24 packs, found 2 epics as well, one of which was Leeroy Jenkins. We spent all evening playing matches and constructing decks. I don’t think I’ve ever had as much fun playing a non-computer game. We finished our last match about about 3:30am. So technically Maruk left with his present on November 5th, his birthday. P.S. It’s still hard to understand some aspects of the game, but a video from Gaming Report was extremely helpful. my name is Florian and i´m from Germany. I´m playing the WoW tcg for 1 year now since release.It´s a nice gameplay.I wrote because i can´t imagine that it´s so hard to find a complete 24-booster including box in your area. See you ingame 4DA HORDE!!! you are one lucky man. I’m the kind of person who doesn’t like to let get of the old habits. I’ve been using Microsoft Internet Explorer since the early days of 1995. IE was on version 3 at the time. I remember getting IE 4 beta and figuring out all the new DHTML stuff and all. Remember the days of “revolutionary” push technologies that never stuck around. Then there were the days of me web mastering stuff, and hating Netscape with passion because nothing would work under it the way it was supposed to. Then Netscape went away as a result of being squashed by Microsoft and that’s where it all stopped. IE hasn’t been updated in over 5 years probably, except for the constant bug and security fixes (which were often delayed as well). 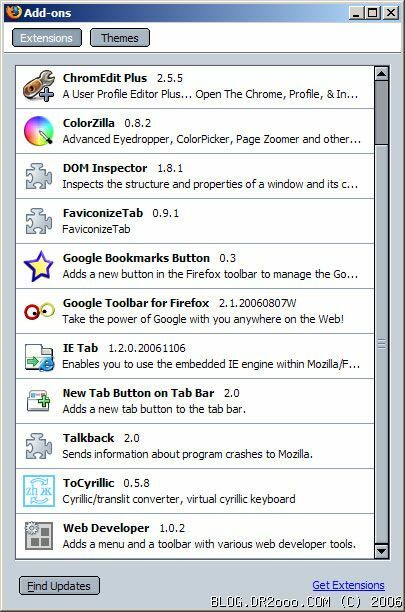 There were several other browsers lurking around, but they never made any serious competition to IE. Then there was Firefox. In its early days it was often clumsy and unrefined. Geoff was trying to talk me into switching for god knows how long now. I even installed it several times, but I never was able to use it for more then a day. Some small detail or imperfection would drive me completely crazy and I would go back to using my old, trusty Internet Explorer. Then IE 7 comes out, with tabs and all. However it doesn’t really seem to work the way you think it should and still keeps opening way too many new windows. In addition to that, after successfully installing it at work and on 2 of my home computer it would refuse to get installed on my main computer, even though all of these 4 computers were bought from Dell and came with OEM licensed version of XP. Nice going, Microsoft. 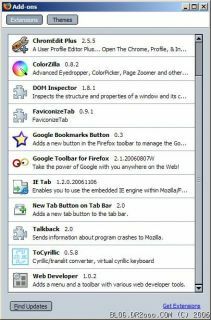 When you’re starting to lose a significant portion of your user base to Firefox you come up with a new version, and don’t let your long time supporters install it without having to deal with some idiotic issues. Anyhow, yesterday I made another try with Firefox, and this time I’m loving it. I installed a number of mods and a skin that I liked. All the things that bothered me can (and were) fixed through the plug-ins. Being a coder has its benefits, ability to fix anything where you can get to the code with ease being one of them. This time around I’m pretty sure that I’m not going to be going back to IE. Maybe some time later I’ll list the mods that I installed and modified, but for now I’ve rambled on for long enough. P.S. Suddenly all my sites (including this blog) started supporting Firefox much better. Now it looks exactly as it supposed to look and how it looked in IE from the beginning. Ha! Chalk up another win for me. I won’t comment on the fact that I’ve been telling you for YEARS to switch to firefox, which doesn’t even need a website’s servers to be operational when loading its pages. Heh. Yeah, that whole “site opens even when server down” is nice. I think we need to hook Brian up that with feature. Other then that, I think Firefox just now reaches the level of maturity to make it get ahead of IE. Yesterday was my 26th Birthday! So happy birthday to me. I enjoyed it! It was nice, and I felt loved and appreciated. Last night we picked up my wedding dress from the boutique, Danya’s pants form a tailor; and bought him a wedding shirt and a wedding tie. Just in a couple of days we’re flying to Vegas, and honestly, I’m very excited about it. No, this doesn’t cover it. I CAN’T WAIT TO GET TO VEGAS!!! I feel a little bit overwhelmed with all the school assignments at the moment. Trying to get good grades and stuff, and already registered for the Spring 2007 semester. Esims site, where actual registration takes place, was screwed up yesterday morning, but Danya did something and we were able to look though the list of the available courses and created a pretty nice schedule. I’m so lucky to have him by my side! My evaluation is still not completed, which limits available classes for me; and I don’t have any GPA yet, so some of the courses are closed for me because of it. My experience with advisers in school is somewhat sad, because they don’t seem to really care. I guess, it’s understandable (need to go to the advisement and orientation office again on Monday to clarify things about Tier III minor requirements). But enough about school. We have a little change in our home environment at the moment. Artem works from our apartment on Tuesdays and Thursdays. He is a fun person – always seems happy and energetic. He loves playing guitar, and couple of days ago changed strings on ours, so he can enjoy it more. He plays guitar quite professionally and even composes little pieces of music sometimes. Tomorrow is Danya’s dad birthday. T.Oksana helped us to pick a little present for him and we’re planning to go out to have a family dinner on Saturday. I love November, because, as d. Borya puts it “it is very fruitful” and it is indeed!! Fruitful it is! In a week we’ll be able to add an “official” birthday of our new little family to the list. I can’t wait either!!! 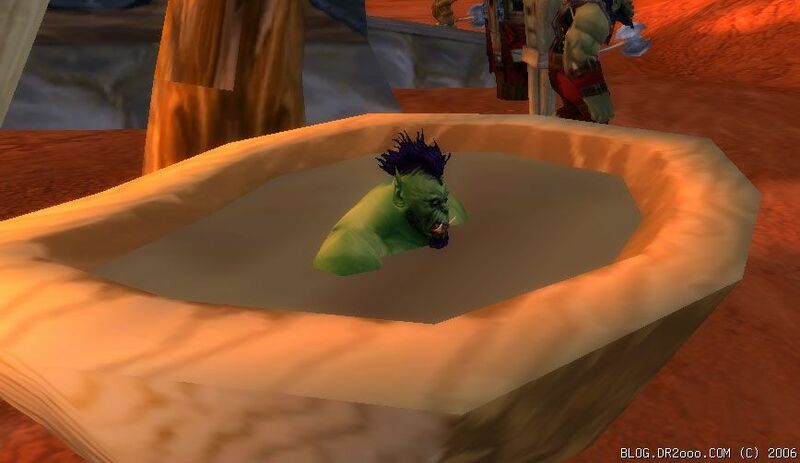 It’s been a while since I’ve posted anything on the topic of World of Warcraft, so I wanted to take some time and do a major update on it here. The thing is that we quit raiding on June 4th of this year. The stress just kept adding up, and I couldn’t take it anymore. Eldar probably was feeling something similar, although I do not remember now. UGH ceased to exist at that point, at least in the form that it was created. In the past 2 days I’ve browsed through the multiple (mostly antique now) threads on UGH forums. The days when we had to fight to keep UGH alive and not let it die in its infancy, days of fighting to keep the rules fair for everybody, and then the last days when fighting was just not worth it anymore. Interestingly enough all the people who caused the most grief are nowhere to be found these days and those who supported us on those steps are still around. UGH has been a long good ride along the way of which we got to meet and play with Thebob, Crawk, Volltok, Glonk and multiple others. The UGH itself didn’t die at all. It still exists and flourishes today, but it took a different shape. Today it’s knows as a Dnevnoi Dozor raiding guild. Yes, it’s that small guild that we started back in 2005 (credit goes to Alena for the great guild name). Now its one of the biggest, well known guilds on the server. As for us, we keep logging in from time to time to do several small quests, or help out on the raids where there are shortages of people, but our raiding days are long ago over, and are probably not coming back. Eldar didn’t login into WoW since June at all, but that’s because he’s just that much better at kicking addiction, as opposed to me. The trip that we’ve been waiting for, for such a long time, has finally started! Yesterday we’ve arrived to Las Vegas and tomorrow we’re getting married! Yesterday and most of today flew by very quickly. We got to our hotel at about 2pm Vegas time. When we were checking in I mentioned that it was our wedding and that it’d be great if they could upgrade our room and give us a highest possible floor, to the receptionist. She didn’t say a single word to me, gave us 2 sets of keys (for us and for my parents) and said that these are nice rooms. When we got up we saw that my parents were on the opposite side of the hall way from us, and our room had a really awesome view of the F*CKING roof!!! I got really mad by such service, went downstairs again, and wouldn’t leave until they let me talk to a manager. I explained to the manager that I picked this hotel out of all the hotels in the world as the place where I would like to get married. I have a lot of guests staying here as well and our ceremony is going to be performed in a sister hotel owner by the same company. 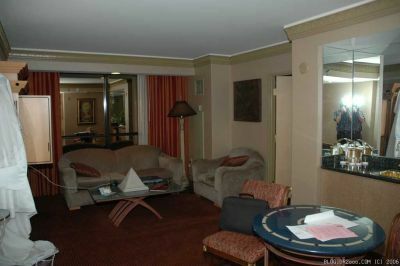 To make long story short, he changed our rooms, gave Alena and me a very nice and big suite with windows overlooking the Strip, and gave my parents a room across the hall from us, on the same, 8th floor. Nice to know that people do care about the reputation of the business after all. After that we met up with Eldar and went directly to the Marriage License Bureau. The whole procedure of obtaining a license took at most 10 minutes. No hassles, no problems. Later on we met up with Maruks, and hang out with everyone for the rest of the day at Fusia restaurant and at rumJungle bar/lounge. Today we did some pool swimming in the morning, checked out the chapel, meet with our wedding coordinator, checked out the hair salon that Alena is going to go tomorrow and gambled for a short while. I lost about $40 on the craps table and Alena put $1 into a $1 slot machine and won $50 back on that same spin. Also we ate our lunch at Wolfgang Puck restaurant which was pretty nice. For the rest of the day we’re planning to go to some club and drink alcohol (what else?). We do not want to stay out for too long as tomorrow is the big day! Congratulations on your big boobied bride! Well done, sir. btw, I stumbled on your site by accident while Google searching “luxor cab” in San Francisco. Go figure. At last we are officially married! !I enjoyed our wedding so much! It was just a perfect one – even better then I imagined. I woke up at 5 a.m. in the morning and was tossing and turning in the huge king size bed till 8 a.m. – time, when I planned to get up and to start getting ready. Danya and Eldar escorted me and Vicky to the beauty salon. They also dropped my dress at the wedding chapel. In the salon a nice Russian lady Svetlana arranged my hair and some other girl took care of my face. Vicky and I had a nice chat, which helped me to relax. After that we went to a bride’s room in the chapel where Vicky and Danya’s mom helped me to get dressed for the occasion. Oksana was so worried and was breathing in a special nervous way. She is a very sensitive, kind, thoughtful, loving, smart person. Boris is one of the most interesting and open-minded people I’ve ever met in my life. Ha!! I have the best parents-in-law!! Danya’s dad walked me down the chapel to soon-to-be husband. When the door opened and I heard “Here comes the bride”, I was so overwhelmed with emotions, that I could hardly hold myself from tears. The minister was great – he seemed sincere and said a lot of good words. We’ve got a DVD of the ceremony and to tell you the truth I was crying both times I watched it. After the ceremony a professional photographer took some pictures and we left the chapel. All of us then drank some champagne in a local food court and around 3 p.m. a black limo picked up Danya, me and 4 other guests for a 1 hour tour around the city. Eldar, Lina, Vicky and Sergey went with us. We took some pictures by the Las Vegas sign and by the oldest chapel in the city. 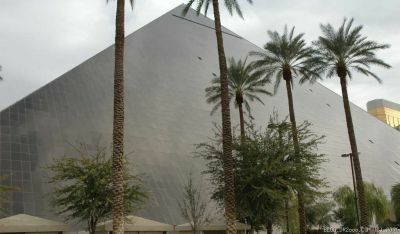 Then we met the rest of our guests by the Venetian hotel and casino, took some more pictures and just decided to walk to the Luxor, where the reception dinner was booked for 6 p.m. I felt so beautiful! People were looking at us, smiling, some were even taking pictures. Many congratulated us and wished us good luck. We got very lucky with the weather. Through our stay in Vegas it was beautiful and sunny and warm. I am very happy with the Luxor stake house. The food was delicious, the service was excellent and the private room rocked!! We overstayed our time limit by 1 hour and nobody said a single word to us. One more funny thing is that at the end of the dinner a bus boy dropped some teacups and saucers and broke a couple of them. Everybody in the room got really excited and started cheering and clapping. The bus boy got scared, as well as our waiters and a manager, who harried into the room to find out what happened. They were laughing so hard, when we explained to them that Russia is one of those countries, where broken dishes considered a good luck. We had a total of 15 guests. I was happy to see every single one of them, and celebrating our wedding with them felt like a warm family event. A lot of kind words were said, and I really appreciate the gesture of coming to Vegas to share our happiness. The rest of the mini-vacation was wonderful and we didn’t want it to end. Now I’m sitting in the living room and reflecting on our wedding day, my beloved husband is still sleeping, the bags are waiting to be unpacked, the pictures are almost ready to be uploaded, the day is fantastic and the life goes on. 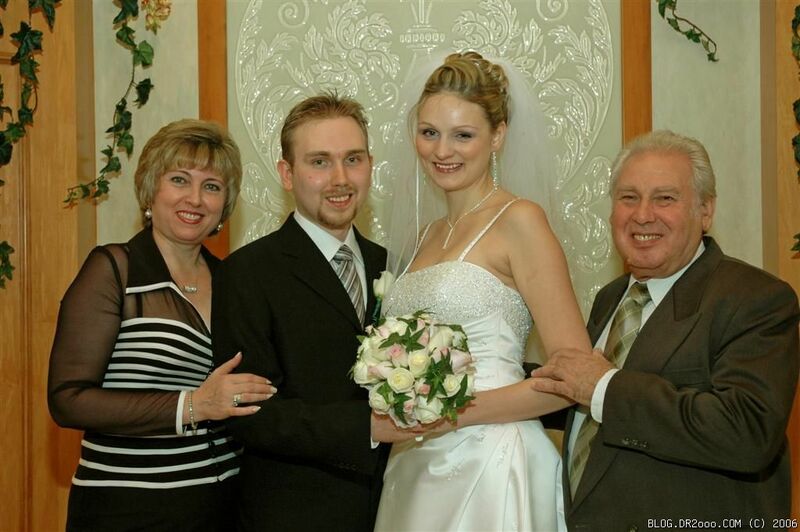 I saw that Alёna posted her version of our wedding day, and before reading it I decided to post mine as well. I didn’t read hers at all yet, so I’ll probably be repeating the same things, but I guess that’s the point. To begin I’ll just say that the day was just perfect. We’ve been waiting until we could even start planning it for years, we were planning it for over 3 months, and I was very nervous about everything. I’m really happy that it worked out great. If I could change anything it would be the fact that I was in such a hurry in the morning that I slipped in the shower and barely survived. The bruises that you see on some of the pictures are from cracking my head on the wall and the floor. Other then that the day couldn’t possibly have been better. Let’s start from the early morning. I woke up at around 9am and couldn’t sleep any longer. You should know that that is exceptionally early for me, as I can easily go on until at least 2pm. Alёna was already up by that time and was getting ready to go into the hair salon. We packed the dress, met up with Eldar and Vika and took a cab to MGM. Walked Alёna and Vika to the salon and dropped off a dress in the chapel. Then me and Eldar met up with Lenchik who just got to Vegas, ate some breakfast and went up to our rooms to get ready. I was running around my room like crazy trying not to forget anything. First order of business – a shower and a shave. Jump into the shower, slip, fall, hurt myself badly – no blood – check. Shave – check. Shirt, pants – check. Tie – check. Suit jacket – check. Rings and the marriage license – check. What time is it? 12:45!! I should be there first, I’m going to be there last. Met up with my family and Eldar’s family, grabbed 2 cabs, went to MGM. Got to the chapel on time, feeling a bit nervous. They put me, Eldar and my dad into groom’s waiting room. Our minister came in to talk to us. He turned out to be a very cool, funny guy. After a bit of waiting we were called into the main room by the minister. 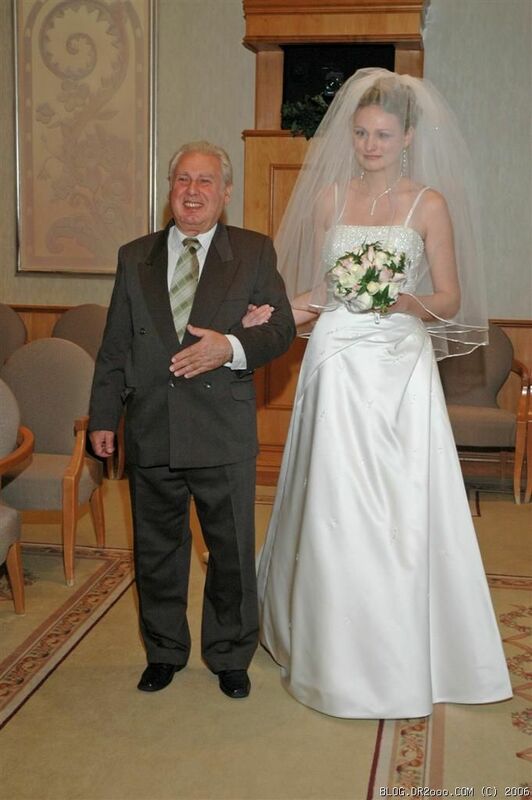 My dad went out the other way to walk Alёna in. Me and Eldar got into the room and stood up next to the minister in the front. The music started playing. The door opened. My heart was racing. First Vika walked into the room, and the door closed. Then the door opened again and I saw my dad and Alёna walking in. My heart stopped and I felt my eyes started to tear up. I was very close to totally losing it. I noticed that Alёna was totally crying at this point already and it made it even harder not to start crying myself, but I managed to control myself. I couldn’t believe this moment was here and she looked so beautiful and we were minutes away from becoming husband and wife. I shook my dad’s hand, took Alёna’s hand and we walked up to the minister. He said a lot of great, wise things, then gave us the rings. Soon after we were married and were giving each other our first “married” kiss. We turned around and the minister in a loud voice said the following: “Now, for the first time, let’s announce them as Mr. and Mrs. Daniel and Alёna RuЬin!” Later on I noticed that not only Alёna was crying, but also my mom, my sister, Eldar’s mom and Eldar’s sister as well. Oh, the happy tears. After that we had a small photo shoot done by a professional photographer. We walked out of the chapel, met up with our guests and went to the closest food court to drink some champagne to celebrate. Then we had a small Vegas tour in a limo and then we met up with all the guests again near The Venetian. From there were started to walk back to Luxor and kept taking pictures. We probably got at least a 100 congratulations and smiles and cheers. A lot of people kept taking pictures of us. And I’ve got to tell you, the bride was impossible to walk by without noticing! By the time we got back to Luxor it was already 6pm and it was time for our dinner. The restaurant and the staff turned out to be great. I was worried that we only had 2.5 hours, but we ended up spending over 3.5 hours in there and nobody said anything to us. They made our day even greater. A lot of great toasts were said and the atmosphere was awesome. Only 17 people of whom everyone was either a close friend or a family member. The food and the cake were great as well. Closer to the end one of the bus-boys dropped a huge pile of plates on the floor smashing all of them. At first he looked shocked. Then when all the guests realized what has happened, they started cheering, yelling and applauding. The bus-boy looked even more shocked at that point. What he didn’t know was the fact that it’s considered a good luck in Russia for something like this to happen. Some staff including the manager ran in to see what happened, and were quite puzzled too. The next day, the manager told me that instead of punishing the bus-boy, everyone was making fun and teasing him now. Well, there is so much more to be said, but I guess nobody is going to read so much, so I’m going to stop. I’m just extremely happy and grateful to our guests to making this day as awesome as it was! Ребъята, рады за вас очень-очень. Всё просто обворажительно, сногсшибательно, умопомрачительно, офигенительно и это, как его там… просто мило! I saw that you recently got married – Congrats! 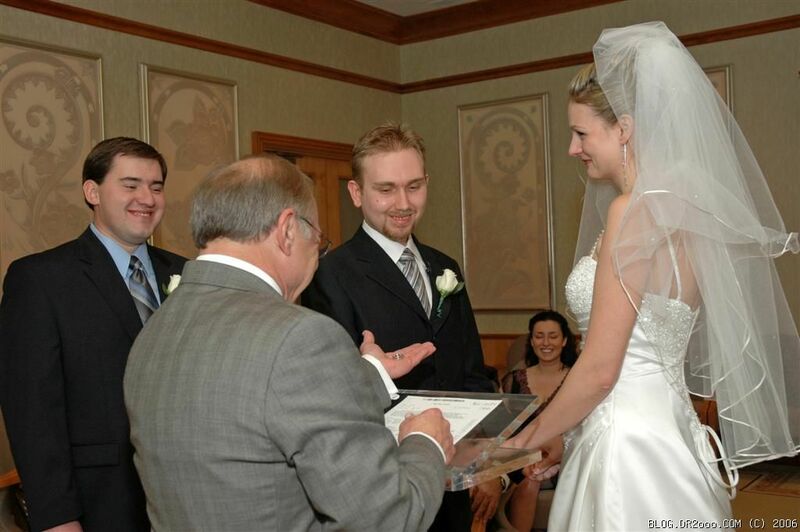 I write the wedding column – Down the Aisle – for the New York Daily News and wondering if you’d have any interest in having your wedding featured in the Daily News. All this would require is a 10-15-minute phone interview with me (super-easy stuff like how you met, got engaged and some fun wedding details) and a few photos emailed so that we could include them with your story. The following Sunday, you would have a gorgeous article – complete with your picture – in the Daily News, all completely free. Please let me know if you are at all interested. We would love to have you.